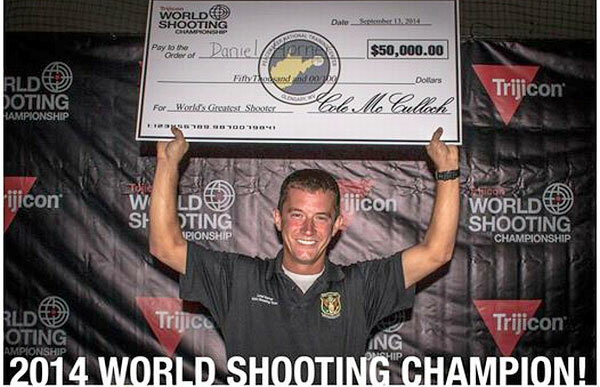 Daniel Horner of the USAMU has been crowned the World Shooting Champion, and he has a $50,000 check to prove it. 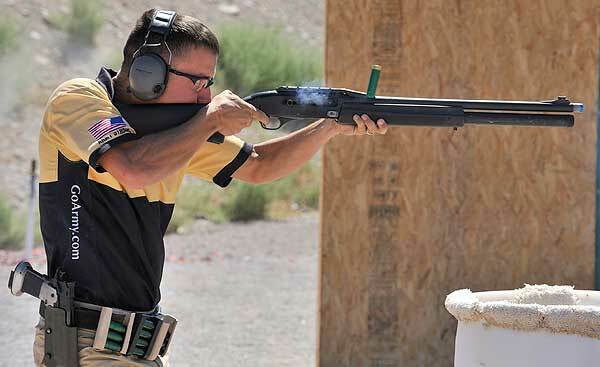 In the first running of the Trijicon World Shooting Championship (TWSC), 159 of the world’s top shooters competed in a grueling 4-day, multi-discipline event. To do well at the TWSC you had to be an expert with rifle, shotgun, and pistol — and you couldn’t have any real weaknesses. You needed mastery of speed pistol, trap shooting, long-range rifle shooting, cowboy action disciplines, “run and gun”, and defensive action scenarios. Horner topped the field with 966.856 points. In second place was Bianchi Cup Ace Bruce Piatt with 924.895. The legendary Jerry Miculek took third with 870.153. Jerry’s performance gave hope for us old guys. There must also be something about Miculek DNA — Jerry’s daughter Lena was the top female competitor, finishing 28th overall. We also want to acknowledge young Brian Nelson who, competing as a Junior, finished fourth overall, a great accomplishment. Other than Nelson, most of the top finishers are professional 3-Gun competitors. These folks know how to put rounds on target quickly and transition smoothly from one firearm to the next. For four days, the shooters competed in twelve equally-weighted disciplines from various shooting sports. The match combines pistol shooting (action and bullseye), rifle shooting (action, smallbore, high-power, and F-Class), and Shotgun (Sporting Clays/trap/tactical). All firearms and ammunition were provided for each event. Competitors came to the Peacemaker National Training Center in Glengary, WV for a chance to be crowned the “World Shooting Champion” and receive a $50,000 first place cash prize. This match carried “multi-gun” competition to a whole new level, with BIG MONEY at stake:. 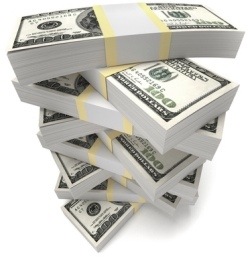 There were cash payouts for most stages and over $150,000 worth of hardware on the prize table. The next TWSC will be held October 15-17, 2015. This inaugural event went well, and it will surely grow in prestige as time passes. However, we do question the notion that this was truly a “World Championship”. The TWSC took place in West Virginia at the same time that the ISSF World Championships were being held in Granada, Spain. That means that virtually none of the world’s top shotgun aces or top prone/3P rifle shooters attended the TWSC — they were in Spain instead. Over 2000 shooters are competing at the 2014 ISSF World Championships, including hundreds of Olympians. The TWSC had less than 200 competitors, and few Olympians. TWSC was, then, more realistically, a North American Multi-Gun Championship. Let’s hope that, in the years to come, the TWSC will attract more foreign-born competitors. That way it can properly be called a “World Shooting Championship”. Share the post "Horner Wins Trijicon World Shooting Championship"
Kelly Bachand competed in the 2014 Trijicon World Championship. Here his TWSC report from Day Two, which involved a 3-Gun Nation-type stage, an F-Class rifle stage, and a .22 Rimfire rifle stage. Day Two included one of the more exciting events, the 3-Gun stage. My squad was just behind the squad with a bunch of 3 gun shooters in it, so I had fun watching Taran Butler, Daniel Horner, Jerry Miculek and others shoot the course. It was a pretty straight-forward course, 10 falling steel pistol targets, 8 clay shotgun targets, and six 3-Gun Nation rifle targets. We could shoot them in any order we wanted. The pro 3-gunners shot it shotgun first, pistol second, rifle last. When it was finally my turn to shoot I was pretty sure I had a plan made out in my head. I started with the shotgun and went 8 for 8 on the clay targets then burned the last round in the hill so I could just dump the shotgun into the barrel. To my extreme pleasure I went 10 for 10 on the falling steel pistol targets and then grabbed the rifle. I fumbled with the safety a bit but finally got it to fire and shot the two outside targets, one from standing and one from a high kneeling position. Then I kicked my front leg way out to a very low kneeling and shot the final 4 targets from beneath the barricade. Most folks shot those targets from prone, but I felt like it was a little quicker just to sit down into kneeling. I did that in about 36 seconds, the fastest shooters did it in about 20 seconds. Next we shot an F-Class-inspired stage at 500 yards. The coolest part about this stage was the electronic scoring system (photo below). There were some other top rifle shooters (Carl Bernosky, Brandon Green, Rob Mango) here and I chatted with some as they came off of the line about the firearms and the conditions. Unfortunately they told stories of rifles that were shooting pretty tall groups, somewhat unpredictably. We shot .308 Win FN rifles with 20″ barrels and detachable box mags. There was a variable-power illuminated optic on top with a bipod and rear rest underneath. Unfortunately, I have to agree with my fellow long range shooters, the set-up wasn’t quite right for the F-Class target, and furthermore it was setup so that us long range shooters had no advantage at all in that stage. Last stage of the day was a .22 Rimfire stage inspired by smallbore competition. We shot targets from 25 yards with the Magnum Research 22 (like a tricked out 10/22) with a Trijicon RMR on top. We shot standing, kneeling, and sitting. We got two sighter shots, but we had no spotting scopes or further feedback after those two sighter shots. I had fun with this match as this reminded me of my first introduction to competitive marksmanship, my high school air rifle team. I harnessed my inner high school self and shot a 148 out of 150, I think that put my towards the top on that stage. That was a very fun and accurate 22 rifle! Share the post "The Inside Scoop from the TWSC — Kelly Bachand Reports"